In 1874, the Rhode Island Legislature created a special squad of state police constables to enforce newly enacted prohibition laws. This is not an article about the present-day Rhode Island State Police, an agency which was established in 1925, but rather it‘s about the state’s first statewide police force, a long defunct organization which existed nearly fifty years earlier that few have ever heard of. 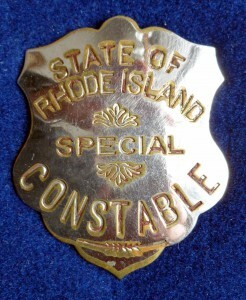 The Rhode Island State Police Constabulary, as it was called, was established by an act of the Rhode Island General Assembly on June 25, 1874. The organization was not a state police agency as we know it today, for their authority was limited to the enforcement of Rhode Island’s liquor prohibition laws. The formation of a state police force was in response to political pressure brought by certain religious and civic organizations who believed that alcohol consumption led to a host of social problems and immoral behavior, and should therefore be banned. They highlighted cases where men squandered their paychecks on booze while their families went hungry, and declared that money wasted in saloons hurt the economy via unsold merchandise in local stores. One may be surprised to learn that these well meaning groups began their crusade in the early 1800s, nearly one-hundred years before the infamous “Prohibition Era” of the 1920s. Of course, not everyone considered the consumption of alcohol to be a problem, particularly those who made their living from producing, transporting, or serving it, or by those who enjoyed consuming it, which seemed to be the majority of the voting block. Even religious leaders disagreed on the issue with some preaching total abstinence, while others urged moderation. It was for reasons such as these that little action was taken by state politicians for the first half of the 19th century. Then in 1852, those involved with the temperance movement succeeded in getting the “Maine Law” passed, which essentially banned the sale and consumption of “spirits” in Rhode Island. Enforcement of the law was left to county sheriffs and local police, and was often selective at best, until the law was finally repealed in 1863. Undaunted, temperance advocates succeeded in getting another prohibition law passed in 1874, only this time enforcement would be carried out by a group of special state constables. “Dry” advocates felt that a statewide police force was necessary to ensure success of the new law since in many municipalities local authorities seemed reluctant to take action. The newly formed state police force consisted of a Chief Constable and seven deputies. Appointments to the agency were political, as they were to virtually all law enforcement agencies of the time, for civil service laws were not in existence yet. The appointees came from all corners of the state; Warwick, Pawtucket, Newport, Providence, Bristol, and Westerly. At least one constable was a church minister, and all presumably did not drink alcohol. The new state police organization wasted little time in getting started. On August 16, 1874, they raided a saloon in West Greenwich and seized a considerable quantity of alcohol. This action was quickly followed by more raids in Warwick and Providence. In Providence however, the state police learned that local officials were unwilling to assist them in any way, and refused to recognize the authority of the new state agency. Furthermore, liquor peddlers in that city had discovered what they believed to be a legal loophole to circumvent the prohibition law by enlisting the help of Rhode Island’s United States Marshal. The validity of this “loophole” was tested when the state police raided a Providence saloon and seized a large quantity of alcohol. The saloon owner cried foul, claiming that the Rhode Island Marshal had already “seized” the alcohol on his premises. However, the seizure was in name only, for the saloon owner had been allowed to maintain possession of his alleged illegal property courtesy of the U.S. Marshal! The owner thereby continued to sell the “seized” liquor in violation of state law. Acting on this information, the state police took possession of the illicit stock, which was within their legal purview to do, but when they asked for assistance from Providence’s Chief of Police, the chief refused, and sided with the Marshal. In other words, the Governor was asked to contact the White House and let the President settle the dispute. Unfortunately the final outcome is not recorded, but one can certainly surmise the politics surrounding this case. When the prohibition law of 1874 was repealed the state police were disbanded. However, another state prohibition law was enacted in 1886, and with it the legislature reconstituted the Rhode Island State Police, this time with a force of one Chief, and ten officers. Under the new law, the state police had the authority to enter an establishment or private home to search for alcoholic beverages without a warrant, and could hold any homeowner or business owner for up to twelve hours while they investigated the allegations against them! Many breathed a sigh of relief when this law was also repealed, and the state police were once again disbanded. In 1919, the Federal Government instituted the unpopular Volstead Act by passing the 18th Amendment to the Constitution, which ushered in the “Prohibition Era” for the entire country. Ironically, Rhode Island was one of two states that refused to ratify the amendment; the other being Connecticut. In September of 1922, two of the most infamous Prohibition Agents to ever work for the Federal Government, Izzy Einstein, and Moe Smith, came to Rhode Island to assist local agents in shutting down the numerous establishments that openly served alcohol apparently without fear of local authorities. Izzy and Moe were known for using various disguises to gain entrance to “speak easys”, yet evidently in “Little Rhody” such ploys were unnecessary. After conducting several raids in Providence, the duo reported that patrons and bartenders alike simply laughed at them, and in one case a pitcher of beer was thrown in Izzy’s face! Yet the worst insult occurred on September 9th when they were both arrested by sheriff’s deputies and charged with assault and trespassing due to a complaint filed by a bar owner whose establishment they had raided! When news of the arrests reached Washington, a team of lawyers descended on Providence to defend the agents. Agent Einstein later described Providence as a “wide open town” that was worse than New York in its disregard of the Prohibition laws. The colorful exploits of Izzy and Moe were depicted in a Hollywood movie starring Jackie Gleason and Art Carney in 1985. The Rhode Island State Police organization that we know today was established in 1925, and although apprehending “bootleggers” and enforcing prohibition laws of the 1920s may have been part of their duties, it was not their sole mission. The “Prohibition Era” ended in 1933 with repeal of the Volstead Act. Even today, there are some who would like to see a “dry” America, but the chances of such an occurrence are slim. History has proven that prohibition of a product doesn’t work, for as long as there is a demand there will always be those willing to supply the want.